Recently watching Bravo’s reality series: “Kell on Earth”, Kelly Cutrone said something I won’t forget. I will have to paraphrase since I can’t find transcripts from which to quote, but in essence she said that when she is preparing an event for a designer or artist, there are stages to the process for them and compared it to labor; as in childbirth. That as their event draws near, artists become wild and unreasonable because they have been carrying something for a time, and it’s going to be born. Presented. Exposed. Birthed. I picture an usher, bringing that person through the chaos so that the artist may focus and push. A doula for artists. Fabulous description. 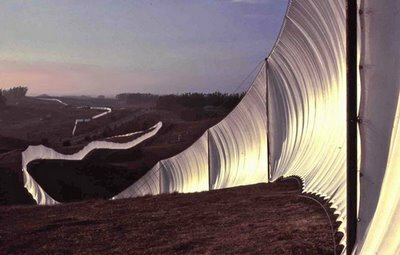 As news of Christo’s and Jeanne-Claude’s famous collaborative “Running Fence,” planned and erected over the course of 4 years, only to be taken down 2 weeks after it was ‘birthed,’ is being exhibited once more, I’m thrilled all over again by this project. What a phenomenal invitation to interpretation it is. For me to ramble on about how I perceived this work would be not only un-schooled but a bit contrived; I’m no expert. Nevertheless, I’m going to squeal a bit because I can’t help it. What if the ranchers and landowners hadn’t said ‘yes.’ What if all of the hearings had amounted to a big ‘no’ from the California government. What if they hadn’t fostered the seed of inspiration, and what if their believers weren’t there to ‘usher’ this incredible project in with them. I remember first being engrossed in the footage of Christo and Jeanne-Claude in the trenches of this project, when I was in college 20 years later. I remember being fascinated by this kooky pair from 70’s, and wondering what sort of hubris you have to possess to blaze this 25 mile trail. BUT I also remember being so inspired by them that what it evoked was something in the neighborhood of fear. When something pushes you to your creative and experiential limits our general tendency is to run, not walk away from it….just out of fear alone. Years later I’m re-examining the “Running Fence” with fresh perspective, and rather than fear, it is evoking motivation. Hubris was not what drove them in 1976; it was balls-out art that will be remembered for decades. What, in my lifetime, is going to be my 25-mile-long statement? Can I even put myself in the category of birthing a new expression? Am I acting as a participant in anyone else’s work, helping to usher in their dreams? Let’s not withhold from each other. Let’s not put out our own fire with fear. Cheers to Christo’s and Jeanne-Claude’s legacy! More information about the exhibit can be found by clicking here. Footage of a 74-year-old Christo speaking about his latest exhibition can be found on the BBC; just click on the link below.